The Flamboyant suite is a very nice room with a large modern bathroom with many windows which give a very nice atmosphere with a large private balcony that overlooks Haysok Temple and our garden. 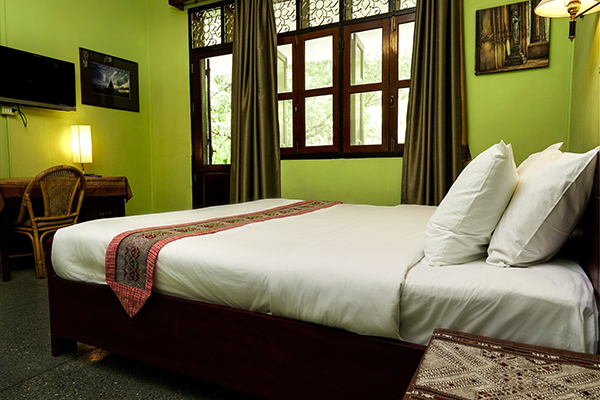 The balcony Golden tree is an attractive room with a queen size bed, the bathroom is large and modern, the balcony is very big with a beautiful view of the garden and the Haysok, temple. The windows are amazing and give a nice ambience. 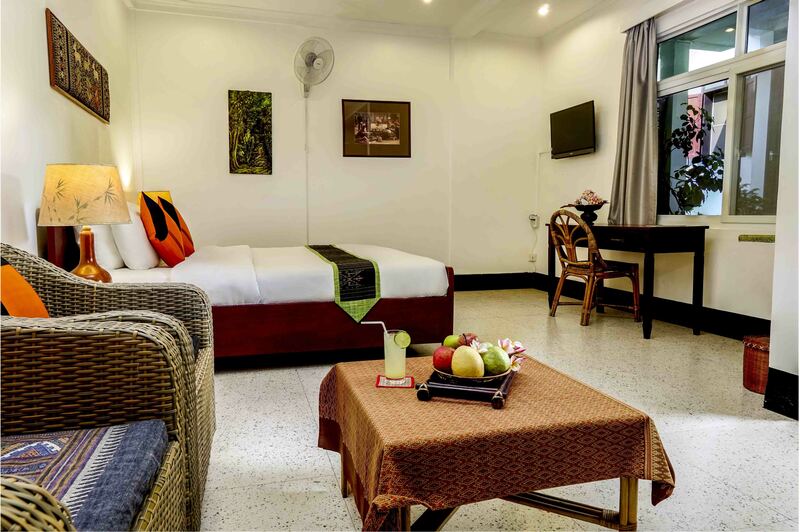 The Lemon grass terrace is a modern and spacious room with a queen bed and an extensive private terrace with seats and plants, ideal for relaxing or working on your computer. 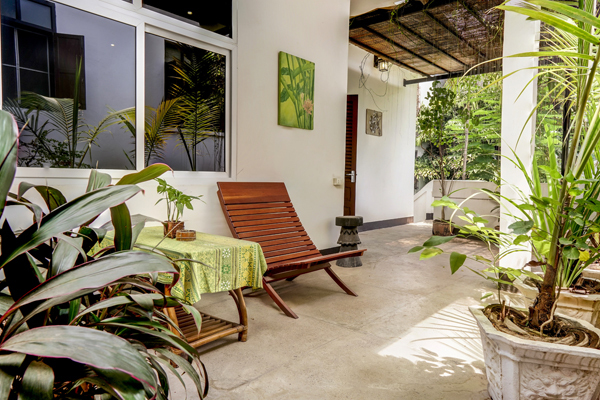 The terrace affords a view of a traditional Lao house while the bathroom is modern and light. 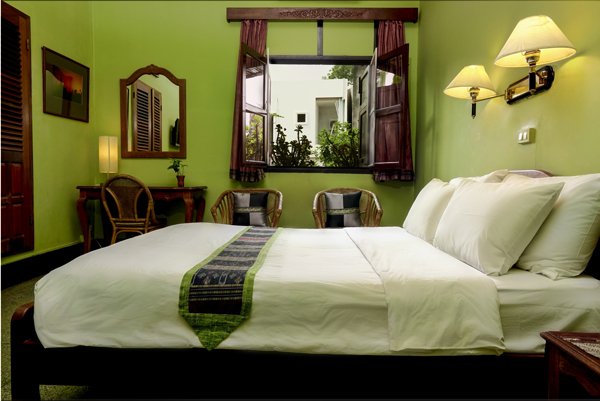 The Sweet basil terrace features a queen-sized bed, a modern and airy bathroom, and a private terrace. The terrace provides a peaceful area with a view of the Lani garden. The Ginger suite has a large living room that leads out to a private backyard with plants and seats. The view through the window is of a small fish pond. 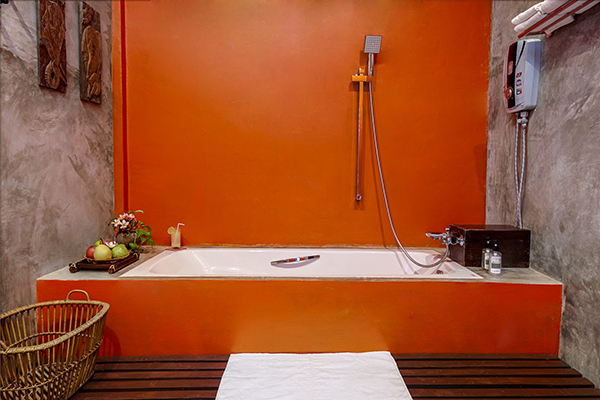 The bedroom and bathroom are spacious and the bathroom features a bathtub with a view of the private backyard. 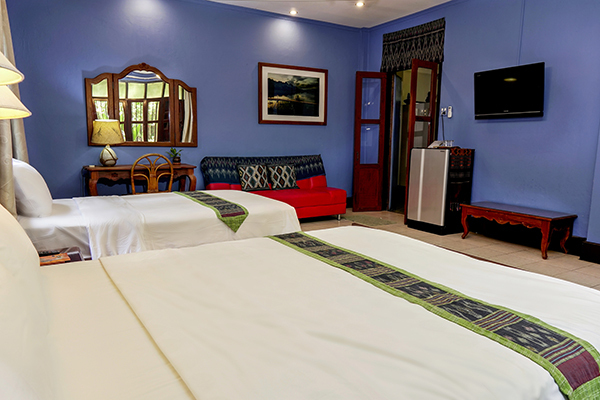 The Mango room is perfect for a family or friends wanting to stay together. This large room offers one double bed, one single bed and a sofa bed. The bathroom is modern and you can enjoy taking a shower with a view of the garden. 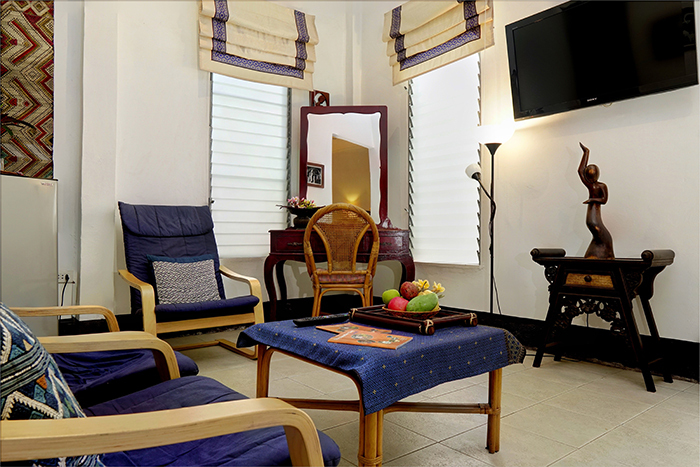 The Cinnamon suite features a living room with access to a large private backyard with fish pond, plants and seats. 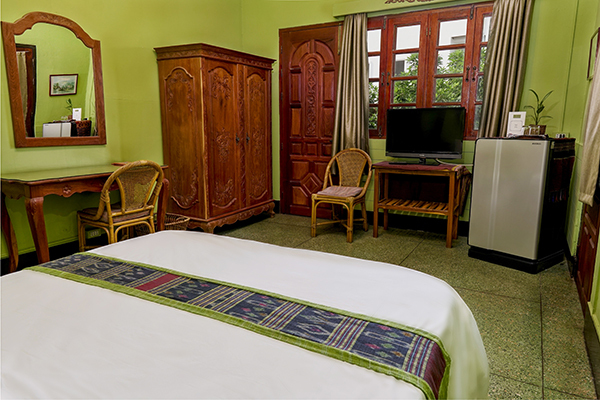 This peaceful room offers a queen size bed and a bathroom that has been renovated but still features 1970's decoration. Groovy. The Lychee room is designed for friends who like to share rooms. It features two comfortable single beds. The windows open onto a small private garden while the bathroom is spacious and modern. 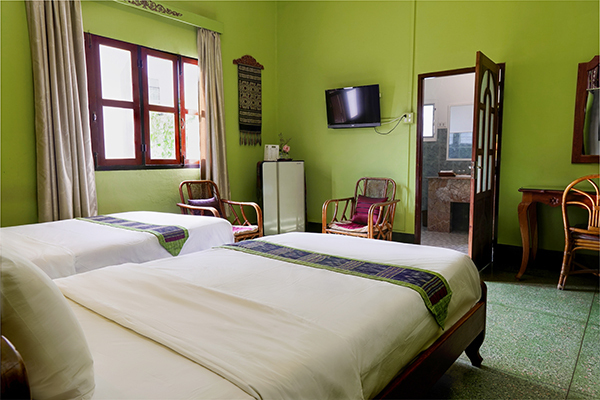 The Orchid room has two single beds, making it ideal for friends travelling together. The long and light bathroom is modern and affords a view of the garden. 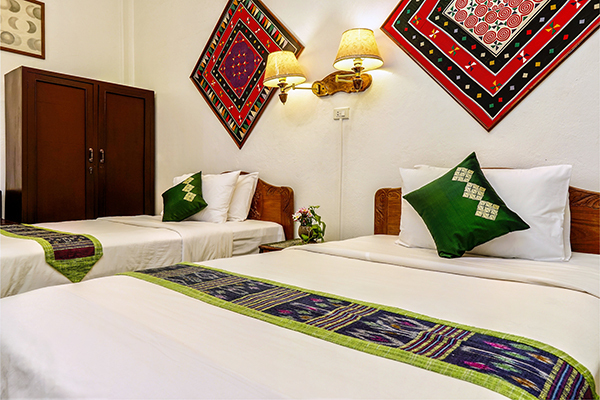 The balcony Lotus is a charming room with a large private balcony that overlooks a traditional Lao house and the grounds of Vat Haysok temple. This room has a queen size bed and a small but modern bathroom.